One early morning in 2016, San Francisco Baykeeper’s pollution hotline began ringing frantically. Concerned swimmers and beachgoers reported trash littering the shoreline and wanted to know what could be done. Our field investigator monitored the area during one of our regular boat patrols, and our staff scientist quickly realized the fireworks extravaganza during the Super Bowl festivities had sprayed a plume of plastic and cardboard debris into the Bay and onto local beaches. When regional agencies expressed a reluctance to do anything about the pollution, Baykeeper’s policy advocates contacted the fireworks company directly and advised them on best practices for preventing pollution from fireworks. The company agreed to use these best practices going forward. For the past two years, we’ve monitored the company’s fireworks shows, and our volunteers have held cleanups of shoreline areas where fireworks debris would be likely to wash up. Fortunately, there haven’t been any more signs of significant fireworks pollution around Bay Area beaches. San Francisco Bay is the Bay Area’s heart and soul. People are drawn to this treasure for boating, fishing, swimming, paddling, kiting, wildlife viewing, and shoreline strolling. The beauty and moods of the Bay connect all who visit or live here to the rhythms of nature. The Bay and its shorelines are also home to seals, sea lions, birds, fish, and other wildlife, seasonally and year-round. But in addition to trash, the Bay is also threatened by other significant sources of pollution, including industrial toxins, sewage spills, and oil. More than 1300 industrial facilities operate around the Bay. Over 90 cities’ stormwater systems and wastewater plants contribute pollution to the Bay. And close to 400 vessels cross the Bay every day. New threats also loom, including sea level rise caused by climate change. In the face of these threats, Baykeeper has been San Francisco Bay’s champion for 29 years protecting the Bay from pollution and other harm. Baykeeper is honored to be the beneficiary of Media SharkTank and to keep partnering with 10Fold to protect San Francisco Bay. And a big part of the thanks goes to 10Fold’s Media SharkTank participants for sharing our commitment to this magnificent body of water that we all cherish. Together, we are creating a San Francisco Bay where the water is clean, the ecosystem is healthy, recreation is safe, and wildlife – including sharks – can thrive. Sejal Choksi-Chugh is the Executive Director of San Francisco Baykeeper. 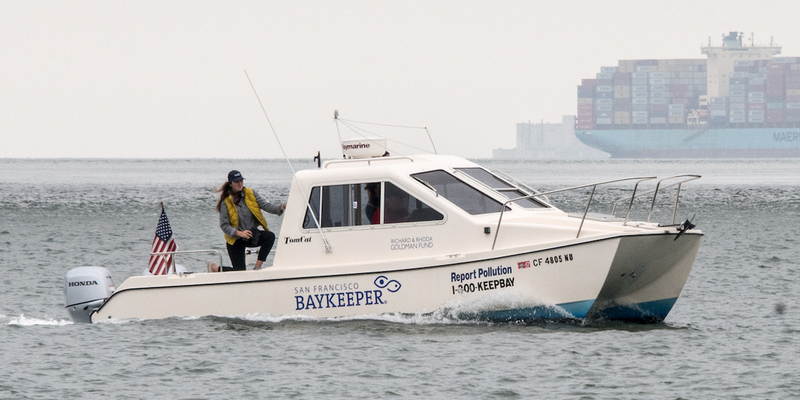 To report pollution in San Francisco Bay, call Baykeeper’s hotline at 1-800-KEEP-BAY (1-800-533-7229), e-mail [email protected], or click “Report Pollution” at baykeeper.org.